Sunk after nuclear test, 10 February 1948. 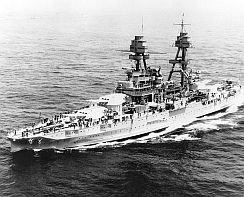 USS Pennsylvania was the name-ship of the Pennsylvania class. If you have spotted any errors on this page (Battleship USS Pennsylvania) or have anything to contribute please post it on the battleship forum.